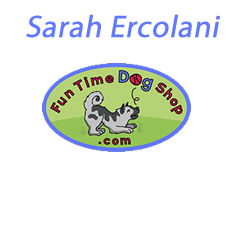 In May 2010, Sarah Ercolani opened in Whitmore Lake, Mi a pet supply company that emphasizes in helping Dog Rescue and Non-Profit Organizations. When opening Fun Time Dog Shop, Sarah had two goals in mind. First, to help support some of the over 6 million dogs that are homeless and placed in shelters or with rescue groups each year. Second is to offer high-quality, reasonably priced products that people and their dogs actually use. 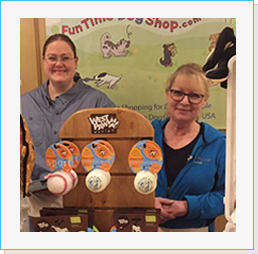 From treats and toys to leashes and beds, Fun Time Dog Shop offers merchandise that has been personally tested by the company’s team of pet lovers. While serving her customers, Sarah is also able to serve homeless animals. She has founded a sustainable, year-round method to raise money for animals in need. In fact, all of the after-cost profits are donated to non-profit dog rescue groups and dog-related non-profit organizations. Prior to opening Fun Time Dog Shop, Sarah was a Human Resources professional for more than 20 years. She holds an MBA in complement to her extensive HR experience and has served as a mediator/trainer for the State of Michigan mediation program. The consummate dog lover, she is also proud of her 10-plus-year stint as a volunteer with Norwegian Elkhound rescue. SSS: What are the biggest challenges you face in your store? FTDS: Competing with large, low-cost retailers on the internet. Due to their size and low operating costs they have buying power that a small retailer is challenged to compete with. FTDS: I often think that every day I raise money for homeless animals is a success. To date we have raised over $20,000 in monetary and product donations for the rescue groups we serve. I am pretty proud of that, but we have a long way to go. FTDS: Continued growth and moving to a larger retail location. One day I would like to be able to fund and operate a rescue facility. SSS: Describe your most memorable promotion or in-store event? FTDS: On Small Business Saturday last November we held a special event to promote small businesses. I was so touched by the large amount of customers and friends that came to show their support for my small businesses in the community and our mission. We offered Small Business Saturday discounts, gave away free goodie bags with product samples and Fun Time Dog Shop promotional items to all of our shoppers, and gave tours of our warehouse. We registered with American Express as one of the SBS Partners so shoppers could receive a $10 credit if they used their American Express card. SSS: What’s the most unique thing you do to keep customers happy? FTDS:It is important to provide high-quality products that our customers love and solve a need. We do our best to listen to our customers and provide the best solution to the needs they have. Plus, for our online customers, we send free product samples with each order. SSS: What advice would you give to a new store owner? FTDS: While it sounds cliché: work hard, take chances and keep a positive attitude. If I had listened to the naysayers who did not have the vision I had, or believed it couldn’t be done, we would have never made it and grown. To shop online or for more information on the organizations who benefit from Fun Time Dog Shop’s fundraising, please visit their website.